"Recently we purchased a one pound bag of this product. They are the best we have ever purchased outside of warm ones in a Mexican restaurant. Good job!" Nana’s Cocina, “Granny’s Kitchen,” is the name for our premium line of corn tortilla chips. Nana’s Cocina products are authentic, delicious Mexican foods made from our grandmother Carmen’s recipes. With many different varieties of chips, you are sure to find your favorite way to spice up your party, or make your every day treat seem like a party. 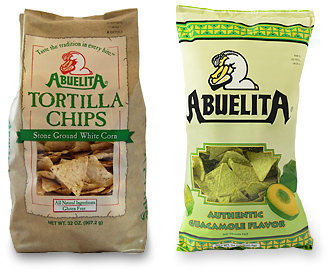 Abuelita is the brand name for a portion of our retail business. This brand combines the old world corn grinding technique with premium, highly refined peanut oil in party size bags. For a list of where to find our products, click here.